Offer your pet the most considerate care! Crafted with premium oxford cloth, abrasion resistant and dirt-proof. 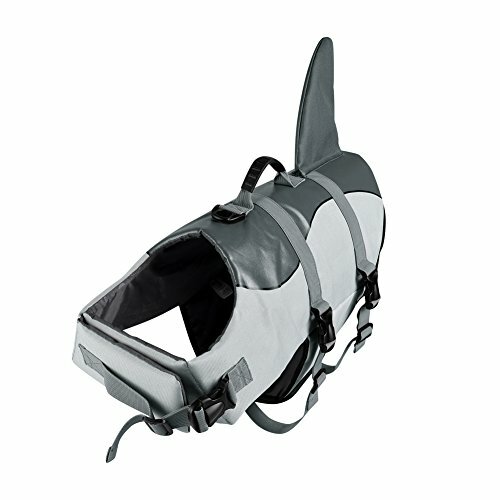 Effectively keeps your dog safe when having fun in the water. Chic cartoon style makes your dog more cute and cuddly. High-standard Material- Delicately crafted with high-density, abrasion resistant and dirt-proof 600D dacron oxford cloth and polyethylene foam, offers the maximum comfort and warmth. Unique Portable Handle- Quite convenient to grab it when putting into or aiding leaving water, make your little one controlled totally. Sturdy Buckle- Match with leash rope, also be resistant to high-strength pull. Wider Range Of Velcro Strap- Freely adjusts the tightness, will not restrain the neck and chest and perfectly adhere to your pet's body curve. Thicker Neck Strap- Effectively prevents your dog's head from falling into water, safe and comfortable.